As Uganda's population increases, many young people are having trouble finding jobs that pay well. A government directive to introduce the teaching of Mandarin Chinese in schools may lead to better employment opportunities. Last year, Uganda's Ministry of Education named 35 schools countrywide where the Chinese language would be taught. "There is a lot of economic activity, infrastructure development, medical, [you] name it, that China is working with Uganda," Baguma said. "And many of our people, the Ugandans, are trading with China. So, China has become a country that we need to get to know and get into it. And the only way we can do it is also through the languages." "I am interested in learning Chinese because it can help me to be employed in Chinese companies. And if I have a friend who knows Chinese, he can get a job and invite me to act as an interpreter in Chinese anniversaries," he said. 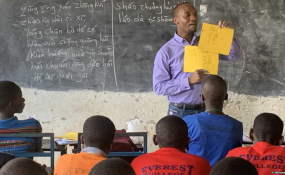 According to Namisi, there are vast opportunities in Uganda for people who can teach Chinese, though he notes that in most cases, it's the Chinese government paying the salaries, and one has to be very professional. "The market is vast, open, but you also have to be, I would say, a titan at negotiations to get the best out of it," he said. "You need to give it your best. You need to play your ace at last. That is how you can be able to get the job. So, you not only have to be good at Chinese language, but also at the culture and the communication skill."